Commonly called ‘Smoke Grass’ or ‘Smokebush’ , Conospermum stoechadis is an ornamental grass with a difference. 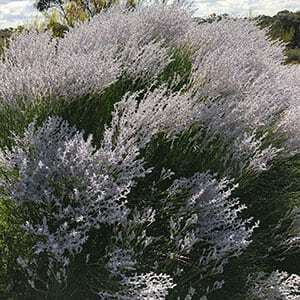 From Western Australia, this is a species with green foliage and smokey white flowers rising above in spring to summer. This is a lower growing species and to us one of the best fro use as a garden plant. 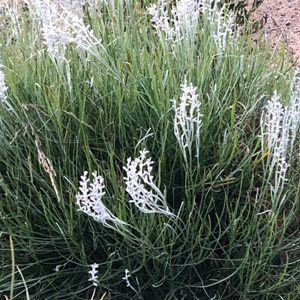 It thrives in a sunny position in a well drained soil and makes an attractive addition to the garden border or a native plant garden. Being from Western Australia, if you are growing this in the eastern states it is best planted in a raised garden bed so that excellent drainage is ensured. It will grow well in these climates and we have seen some good specimens in the grounds of the Royal Hotel in Dunkeld Victoria. C. stoechadis itself will reach around 1 metre in height (sometimes a little taller and spread to around one metre plus. Other closely related species have different growth habits. C. tripleimervium is taller growing reaching around 2 metres, commonly known as the tree smokebush. C.incurvum is a smaller growing species known as the plume smokebush. C.undulatum is known as the waxy leafed smokebush. With over 40 species, Conospermum do differ in habit, however all grow in similar conditions. Propagation is from seed or from cuttings, however considered to be difficult by both methods. From seed, a smoke water treatment is recommended.